Dar al-Kalima University College of Arts & Culture | Timely upcoming Conferences! Featuring Rev. Jim Winkler, President of National Council of Churches, Rev. Dr. Mae Cannon of Churches for Middle East Peace, Sojourners' Founder and President Jim Wallis, and Bright Stars of Bethlehem President, Rev. Dr. Mitri Raheb. The recent move of the American Embassy from Tel Aviv to Jerusalem has changed the conversation. Historic commitments to Jerusalem as a city for two people of three faiths are being threatened, along with the hope for peace. While the importance of the city for Jews is not questioned, its significance for Christians and Muslims, and particularly Christians is overlooked. For people of faith and for those concerned with peace in the Middle East, an inclusive Jerusalem is a must. So, what do we need to understand about the current political realities in Jerusalem, the implications of theological frameworks of the city, and current US and foreign policy? Finally, what steps can we, as faith leaders take together and in our own networks to advance peace in this region? 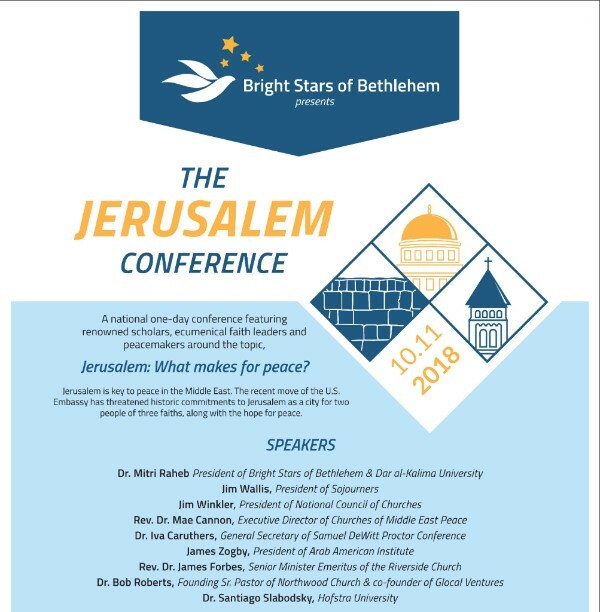 In addition to responding to this urgent moment, The Jerusalem Conference is, in part, a follow up from the 2016 Atlanta Summit at the Carter Center hosted by President Carter, which brought together key representatives from 26 denominations as well as numerous faith-based organizations working towards a just peace in Israel/Palestine. This one day conference offers a timely exploration of Jerusalem as key to peace in the Middle East. Together, we will identify concrete steps and goals towards advancing the vision of an inclusive, diverse, and equitable Jerusalem. 2-3:15P PANEL 3- Towards a balanced US policy on Jerusalem: What is possible under the Trump Administration? WHY "Women's Rights in the Middle East Today: Law, Culture, and Religion"? This conference brings together leading experts in the fields of local and International Laws related to Women's rights, as well as key representatives of theological and cultural institutions working in this field; a unique assembly of scholars, researchers, and high-profile advocates in law and related fields. The aim of this conference is to spark an international dialogue on the current impact of law, culture, and religion on the condition of women in the Middle-East. "Jerusalem: National, Religious, and International Dimensions"